Maayong adlaw sa inyong tanan. Good day to all. A party wouldn’t be complete without cake don’t you think. Please grab a slice of this Ube Macapuno Cake and let’s get started. Hi! I am Abigail a stay at home expat Mama residing in sunny Dubai. 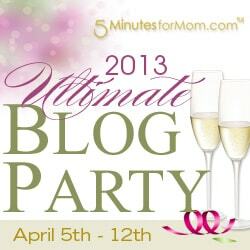 This is my first Ultimate Blog Party and I’m excited to meet and read about you. First a big thank you to beautiful twin bloggers, Janice and Susan of 5 minutes for Mom for hosting this event. I first read about the party over at Grace of Sandier Pastures and I just think it’s a wonderful event to get to know people across the blog sphere. We have been a resident of Dubai for 4 years now. Deciding to move here and leave my 8 years of corporate life back in the Philippines was quite difficult I didn’t know if I was ready to live a life away from the comforts of a paying job and the help I get from my relatives in taking care of my son. Looking back I don’t regret the decision I made, moving here made me into a Super Mom (but I do have my moments of tantrums which can be cured by having my nails done or a tub of ice cream). Would you like a cuppa good coffee with your cake? I am a Mama to Vierte – 5 years old and Chloe the newest addition who is 9 months old. V currently is in Foundation Stage 2 class and enjoys singing (He just did a solo song number in their yearly concert), and currently collecting the Skylander Giants (and playing the ps3 game with Dad) he can’t stop talking about them and even ask me to record a video. Our pouty LittleMiss C has just started to learn how to walk with the help of tables and chairs to pull her up and cruise around the house. She started solids at 6 months which I prepare at home but is not really interested and would rather breastfeed instead. My two angels are keeping me really busy and my schedule depends on their activities. How do I manage to get some me time you may ask? MyNappytales is my escape from the four corners of our home. I first started the blog to update our relatives then I eventually met some blog friends and talking to them online is like leisurely sitting on a café (while in reality I’m a MumPacifier to LittleMiss & mopping the floor). Enough about us, I know you still have to party. Please leave a comment and link to your blog so I can party with you. Before you do leave grab a chocolate chip cookie and subscribe to my RSS feed and via email and let us continue sharing stories. Your kids are gorgeous! Yes, I’d love some of that cake please and some chocolate chip cookies, too! Hi Tat! Thank you for dropping by. Hope you’re enjoying the party with a cookie and cake in hand. I love reading about families in different cultures and countries, and your kids are adorable! Thanks for visiting my blog and I was happy to read through yours today. I read your previous post about your son asking what you were going to be and it reminds me of my kids. They always want to know when I am going to get a real job 🙂 I was glad to meet you through the UBP13! Hi Abigail! Your kids are so cute, and your smiley Chloe is making me excited for the next stage with my own little girl. (Just a few more weeks till she starts smiling responsively – I can’t wait! 🙂 Anyway, Dubai?! That’s awesome! I’m excited to poke around here some more! Thanks for dropping by. Will party with you in a bit. Hi! Thank you for dropping by and sorry for replying so late. Welcome to blog world hope you are enjoying it. Previous PostWhat are you Mom?